This bag belongs to Suzanne Stevens. On the front are three elephants. Including two side silhouettes and the middle one facing forward. 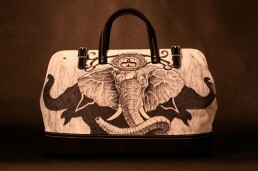 The elephants are in memorial of her late husband, Myron and the number 3 was his favorite. On the back, there are nine roses. 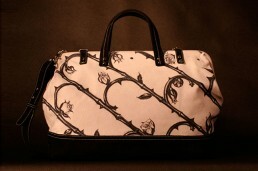 Roses are Suzanne’s favorite flower and the nine roses represent her nine children, Bag 027.